The day I heard Monk Kitchen was being shuttered was a sad day. Course after course of what Chef Roberto Fracchioni was churning out at the Chef’s table was fantastic – everything tasted great, for sure, but it was friendly behind-the-scenes view of the kitchen (and bantering) that made the experience incredible. I’ve since tried Flor de Sal, Fracchioni’s new restaurant; everything about the dinner is fancier, but the magic isn’t there. Hence, after hearing the initial reviews on Parcae, which now occupies the former Monk Kitchen digs, I had reservations already … the use of offals in a brilliant manner, but ultra-small portions. It sounded hoity toity, nothing like the warm hearty creations of its predecessor. It wasn’t until Winterlicious that I decided to give Parcae a chance – even if the dinner wasn’t fantastic, I’d be out $38, a manageable sum. On this visit, the restaurant was much easier to find (firstly, there was a board with the restaurant’s name out front) and I knew go to the left of the lobby and down the stairs to actually get to the dining room. Our waiter, tatted with gorgeous geometric forearm tattoos, was just as friendly as the Monk Kitchen chefs. 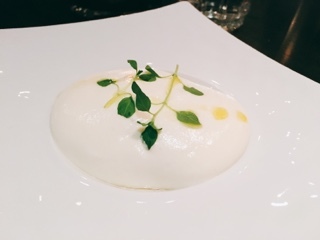 I took a deep breath… maybe this will be amazing, why had I waited so long to try Parcae? Certainly, the $7 glass of wine (another Winterlicious special) helped, the balanced Syrah coaxing me into comfort. 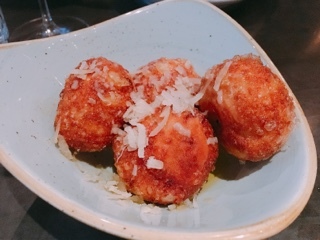 Then a bowl of house fried bread arrived – a genius concoction – balls of hot crispy goodness. The hard crust cracks to let you into the soft but chewy dough in the middle. Each morsel is covered with salt and grated pecorino crotonese cheese to give it a strong savoury burst. It even sits in a pool of olive oil, which thankfully doesn’t soak into the bread. The only “healthy” element is the thyme leaves dotted within the batter. Give me two bowls of these with wine and I’d be happy. Feeling adventurous, I started with the cervelo or deep fried lamb brains. 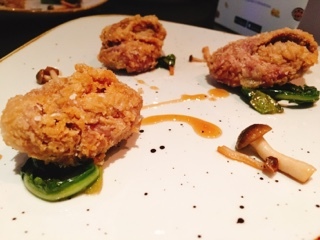 Even as the server sets down the appetizer, she warns that it’s best to eat them with a bit of the vinegary greens and plump mushrooms. The first bite (with all the condiments) is actually great – since the cervelo is piping hot, all you can taste is the crunchy crust and creaminess before everything’s swallowed to avoid a second degree burn to the tongue. Then as the temperature drops and the meagre greens and mushroom supply depletes, the creaminess finishes with a gamey aftertaste and my once gung-ho feeling starts to wane. It starts to feel heavy … the creamy bite that just slid down my throat has turned to sludge. Truthfully, I would have given up every brain fritter for just another ball of fried bread. Oh well, I’ve tried it and have briefly supported the nose to tail movement. 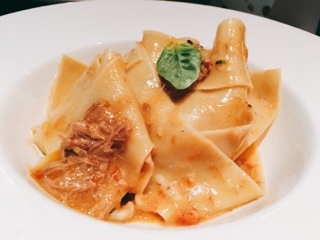 Continuing on the lamb journey (if I’m going to eat the head part, I may as well benefit from indulging in the meat part of the animal as well), I chose the lamb parpadelle as the main. Aside from the bread (I know quit harping on the bread), the pasta was the best dish of the evening. The ribbons were thin and silky and the sauce closer to an au jus consistency so it just clings to the pasta. Then you lift the ribbons and little strands of scamorza cheese pulls apart. It’s a great dish - if only there was more lamb and it didn’t arrive in a kid-sized portion (seriously, the kid-menu fettuccine alfredo at Earls is comparable). I almost felt bad taking a bite of my friend’s duck raviolo; after all, the lone thing at the bottom of the dish already seemed so meagre. Yet, our friendly waiter had raved about them, so a bite was in order. Although the rest of the table loved the raviolo, something about the creamy mascarpone sauce ruined the otherwise delicious braised duck filled pasta. Maybe it was the hazelnut pieces (why ruin a hearty pasta with nuts?!) or the lack of crispy duck skin as promised on the menu. The raviolo was no parpadelle. 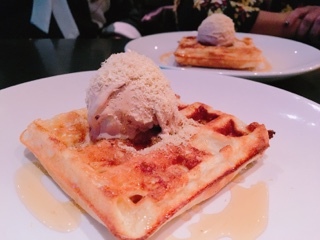 After an exciting starter of lamb brains, my dessert waffle seemed so safe– it’s not overly thrilling, but it’s also hard to mess up. Parcae had the requisite eggy batter and crispy edges and the waffle neutral enough that the sweet Nutella ice cream wasn’t overpowering. But then the chef adds a shaving of frozen foie gras on top: that one ingredient made the dish, adding a creamy saltiness to everything. Following such a nicely balanced dessert, a taste of the pudding chômeur felt like someone pumped a syringe of maple syrup into my mouth. Soaking cake in syrup already makes for a sweet dessert, so adding banana and peanut butter ice cream to it seems over the top. Something simpler like an unsweetened Chantilly cream would have been better and not leave me reaching for water. 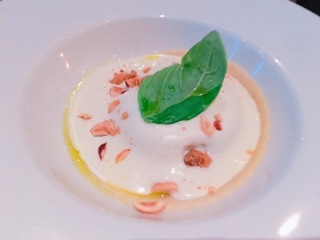 Perhaps even a spoonful of the buffalo ricotta “pannacotta” would suffice. After all, it was watery enough to melt into the chômeur. Someone must have forgotten to add gelatin to the dessert as what arrived is more fittingly described as creamy cottage cheese with poached cinnamon quince (like a firm pear), this can’t be a pannacotta? A meal that started strongly slowly waned at the end. 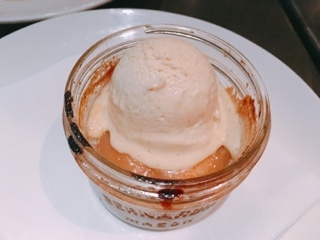 Parcae certainly offers interesting options, but some things are just too hoity toity for its own good: the toppings on the duck raviolo is overly fussy and desserts like the chômeur simply overpowering. And don’t think the portions have shrunk in lieu of the Winterlicious special – judging by regular reviews, it’s always this small. So, unlike other three course meals, you’ll leave yearning for something more. One guess what I was yearning … of course, those genius fried bread balls. After contacting the restaurant to understand why there was absolutely no savings for dining there during Winterlicious (something I thought the City of Toronto requires), they responded that the fried bread served at the beginning normally costs $5. There you go: you get complimentary shared bread. Parcae is the worst value I've ever calculated for a Winter/Summerlicious experience.